This trek offers a nice compromise for canoeists of moderate or varying skills. This trek can also easily be made into a 50 Miler by going down to the end of Tupper and back up. Some of the advantages of this trek include wildlife viewing opportunities on the Raquette River and a bald eagle’s nest at Indian Point on Tupper Lake. There is one long portage. Depart Rollins Pond Canoe Base. 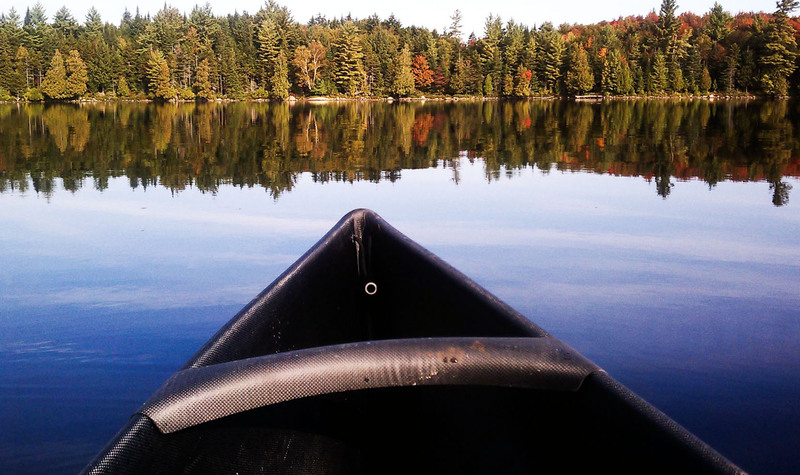 Canoe to Floodwood Pond, into Little Square Pond, through Fish Creek, and into Fish Creek Pond. The public campground picnic area is a good spot to have lunch, having fresh water and flush toilets. Continue on through Fish Creek Ponds, and either head out into Fish Creek Bay in Upper Saranac Lake, or head north into Follensby Clear Pond. Recommended campsites for the first night are in Saginaw Bay or on Buck Island, in Upper Saranac Lake or in Follensby Clear Pond. Depart Follensby Clear or Upper Saranac, head south through the narrows of Upper Saranac Lake and continue to the south end of the lake. Take the Indian Carry into the Stoney Creek Pond. The first half of this carry is hilly, muddy, narrow, and crosses Highway 3, so be careful and stay together. Possible destination sites for the second night are Trombley or Axton Landing on the Raquette River. An alternative camping spot could be in the Stoney Creek Ponds or at Indian Point at the southern end of Upper Saranac Lake. Hit the Raquette River and head west towards Tupper Lake. As you head near Tupper Lake, you will begin to encounter motorboats and go through the Oxbow, a marshy area of the Raquette that can be a bit confusing. Make sure to stay left and follow the main current. As you approach Tupper Lake, you can opt to take the Simon Pond cutoff or continue on the Raquette to Tupper Lake. Good camping spots could be Trombley Landing (depending on where you camped the night before), on Indian Point on Tupper, or at the south end of Tupper. Indian Point is a popular destination, as it is close to the Village of Tupper Lake and the boat launch. This is a good day for some day paddles, either to add some miles in order to achieve the 50 Miler award, or to enjoy the nice scenery that Tupper (especially the south end) has to offer. You could also work on advancement or activities. Pick-ups can be done at three locations on Tupper Lake. There are two boat launches, one downtown, and one a mile or two south of town. You can also get picked up in South Bay in the southern end of Tupper Lake.